Social media has brought anniversary dates to the forefront. 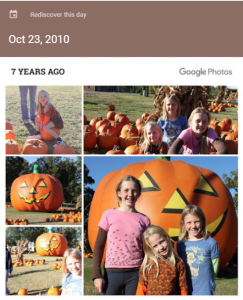 Every day, my view of Google Photos or Facebook shows me a collection of photos from exactly some number of years ago to remind me of how good things were back then. These apps are performing the simplest of date-based math to trick me. They think, "We have a collection of photos from this month/day from some previous year -- let's collect those together and then prey on Chris' nostalgia instincts." Sometimes it works and I share them with friends. Weren't my kids so cute back then? It's true, they were -- but I don't pine for those days. I live in the present and I look towards the future -- as all citizens of the world should. If I wanted to go 6 years into the past, I would simply change that first argument to 'year'. 6 days? Change it to 'day'. Here's the (very long) list of built-in intervals that INTNX supports. The form I showed above works with DATA step, but I usually capture this value in a macro variable so that I can reference it across different procedures without having to recompute it. To express this in the SAS macro language, I need to wrap those two function calls (for the TODAY function and the INTNX function) in %SYSFUNC -- the macro function that breaks out of macro processing to invoke built-in SAS functions. I also need to remove the quotes around the interval and alignment values -- the SAS macro processor will treat these as string literals and would not approve of the quotes. Notice the result is a number -- which is exactly what I need for date value comparisons. But what if I wanted a formatted version of the date? The %SYSFUNC macro function has an optional second argument that accepts a SAS format name, allowing me to create a value for display. First, an acknowledgment. I recently had the privilege of presenting at the Quebec user groups with SAS-world superstar Marje Fecht. Marje is an excellent instructor, and she delivered a popular talk about working with SAS date values -- a topic that trips up many new SAS users. It's useful for me -- someone who has used SAS for a long time -- to see a basic topic presented to me as if I were brand new. Her talk reminded me of some good practices that I was able to bring home and apply in my own production SAS jobs. I know that Marje was invited to present this talk at SAS Global Forum 2018, and I hope that I did not steal too much of her thunder. She has a good origin story about the 01JAN1960 date decision. You should attend the conference and see her talk in person. The INTNX (and its sister function for computing date differences, INTCK) are powerful tools for manipulating date and datetime values. Other programming languages offer complex code libraries to accomplish what these two functions can do as part of Base SAS. They are tricky to learn at first, but once you get the hang of them they can really simplify your SAS programs that deal with time-based data. Rick Wicklin presented a useful introduction to both functions in INTCK and INTNX: Two essential functions for computing intervals between dates in SAS. While these functions are available in Base SAS, they are maintained by the developers who look after SAS/ETS (econometrics and time series). You'll find comprehensive usage information in the SAS/ETS documentation. The functions are incredibly important, as they are often used to calculate dates and times that are used in legal and financial applications. Those industries take their dates/times very seriously. For a fun example of how deep it can get, see this thread on the SAS Support Communities. I always love learning something new about the INTNX and INTCK functions. Thanks for sharing the tips and resources... I didn't know that these functions are maintained by the ETS developers. Thanks for sharing tidbits from our time in Montreal and Quebec City, Chris. The additional spins on my topic, as well as the further references are both great additions to what I am preparing for SAS Global Forum 2018. Thanks for sharing this article with resources.